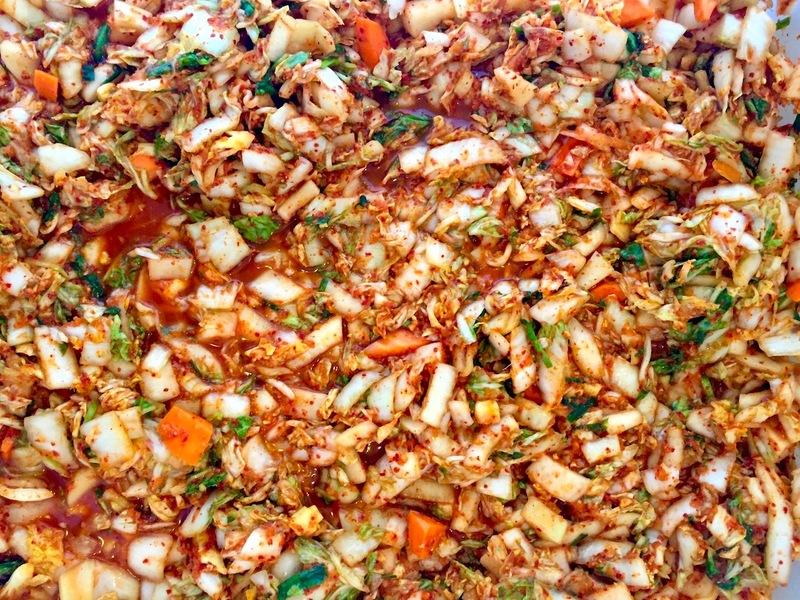 I spent the weekend chopping, scrunching and bottling vibrant, organically grown vegetables in preparation for fermenting kimchi (seen above), and various krauts and preserves for upcoming market sales and to give away at some of my book launch events; click here for more information about classes, markets and events. More about ferments in a mo. On Sunday I had help from the wonderfully named and delightful Hector Henderson. He is 23 and here in Sydney from London for a while, honing his kitchen skills. His parents are both famed and gifted restaurateurs but who young cares to learn all they could in life from their parents! Hector is working five fourteen hour shifts a week, he is focussed on becoming the best chef he can be and yet, he came to me on a precious day off, to chop for several hours. He did this skilfully and with great heart and I believe he would agree, that a good time was had by all, there was laughter and food and plenty of tales told. 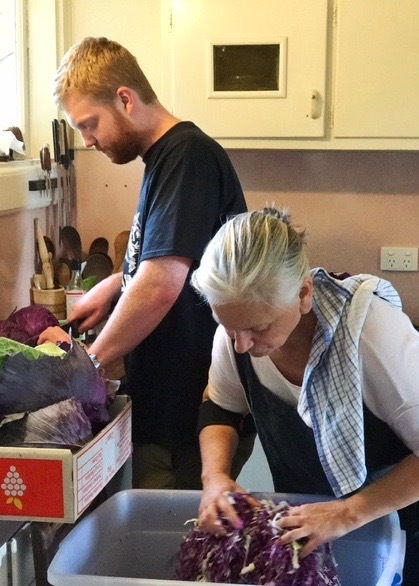 We chatted as we chopped and I was reminded of his Mum, who worked with me at Iku Wholefoods when she was Hectors age and I was 28 and laughter was a regular and loud part of food prep there. There is nothing like our or our friends children attaining adulthood to cause us to reflect on the passing of time. Mostly, I think we tend to reflect on what we think we’ve lost and on the less attractive aspects of growing older but sometimes, for a moment or in a moment there is the opportunity to reflect on what is good about becoming an elder in the world. Joy, I think, is brought about more by giving than receiving, when we can share with another what we know or have learned along the way. More joy is delivered when what we have to offer is seen to make a difference. Hector provided his youth and vigour and I a little know how in the art and skills of fermentation, with a few pointers for how to recognise what is happening when. Keep the contents submerged and airtight, keep the jar clean, keep them cool and not in direct sunlight, open now and then to allow excess c02 to escape and wait until they have become as sour and complex and delicious as you like them to be before eating them as condiments. I have been fermenting foods for many decades and for decades. I was the strange girl and then woman, who put ingredients in crocks and jars and over time filled the kitchen with their potent ponging; before offering one and all a swig or a bite. At last my lifetime of experience seems to have found its place, as the western world now recognises and acknowledges, the value of this ancient art and its products. When I wrote Nourish in 1999, I sought to have a range of fermented foods included but the publisher assured me ‘no-one will be interested’, the concession was the inclusion of a recipe for making sourdough bread. In macrobiotic philosophy, which considers ‘the order of the universe’ it is said, that everything has a polar opposite and with the passing of time, everything changes to its opposite. 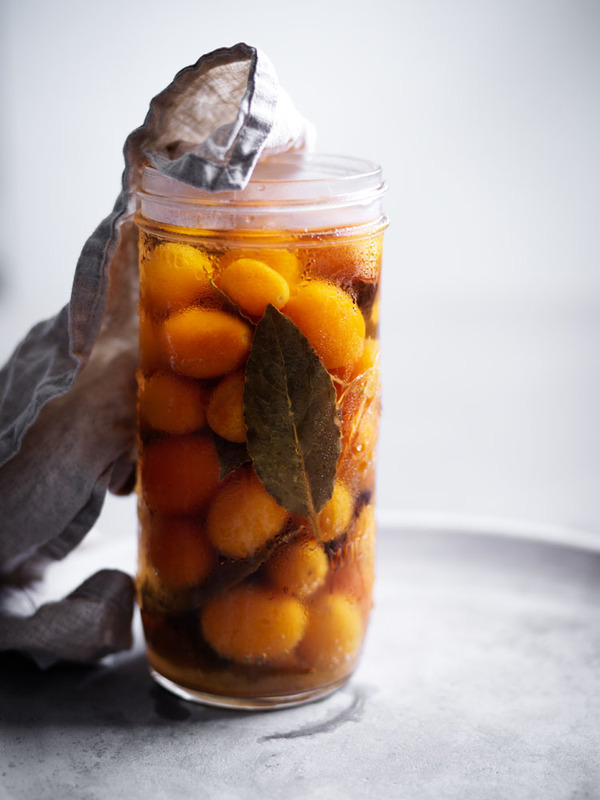 This is clear when we consider, night turns to day, warmth to cold, wet to dry and in the case of these Kumquats from so bitter and sharp they are unpalatable to quite sweet, mellow and divine, an excellent addition to a cheese board or slivered over a grilled oily fish. The reclamation of fermenting knowledge and skills is now recognised as a vital contribution to combat the myriad of ills caused to so much of our society, as a result of the degradation of food production, farming practises and animal husbandry. When it comes to many fermented foods, the passing of time is a critical component for their deliciousness and their efficacy. Suspending the joy of eating lacto fermented foods is worthwhile. This is because these salt and acid tolerant organisms have a better chance of reaching our large intestine, where they offer support to our local residents there, when they have had time to become more acidic. Less acid tolerant strains then die off and the more acid tolerant strains take over, it is these that will then be unharmed by the acid environs of our stomach. It is possible to eat ferments from day one but there is great value in giving them time to mature. 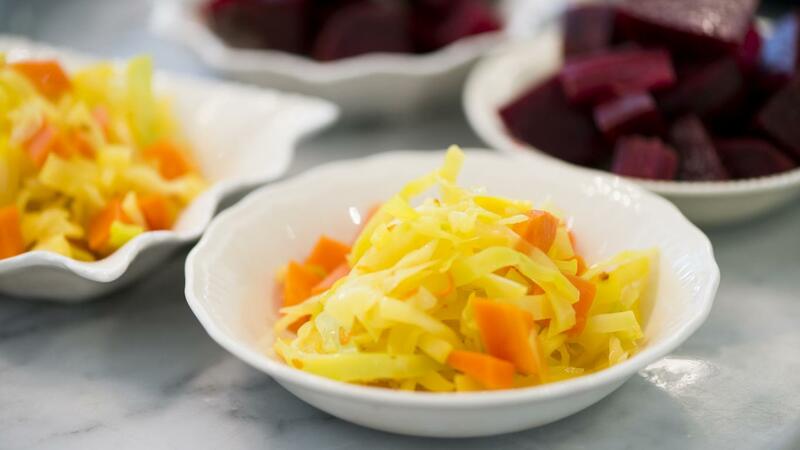 This process can be speeded up by leaving the ferment in a warm place but they will be most delicious with complex flavours and perhaps also most effective, when they are left in a cool place for longer, out of direct sunshine. Once opened keep the contents submerged and the top of the jar clean, pop them in the fridge where they will keep for months at a time. Very much more detail and a diverse range of recipes can of course, be found in my book, which you can see a little of and preorder here.